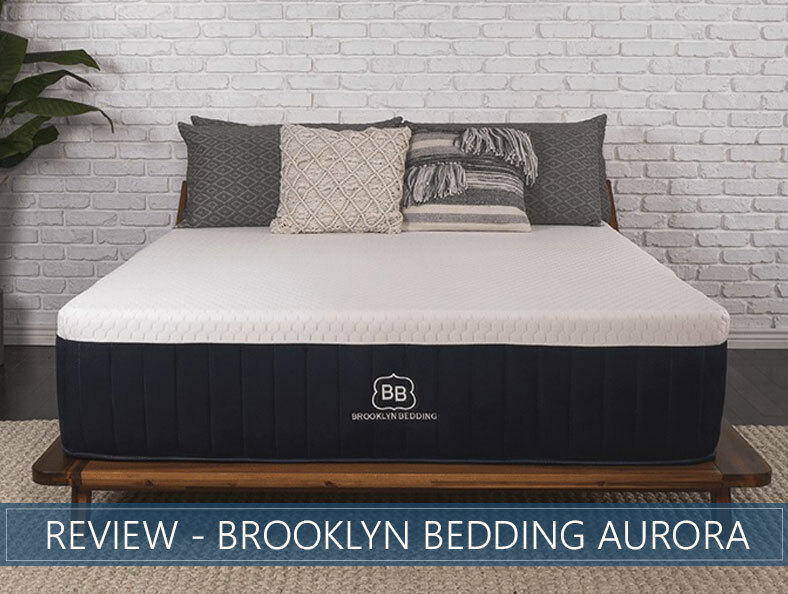 Our in-depth review of the Brooklyn Aurora will take you through each layer to show you all the high-end cooling and comfort technology incorporated into this mattress and how it performs with pressure relief, support, and motion isolation. The hybrid comes in three different firmness levels, and this review focuses on the Medium, which will accommodate the widest variety of individuals. How can the company offer such a high-end product for less? They own and operate their manufacturing process, meaning they do not use expensive middlemen and can incorporate higher-quality materials for less cost to shoppers. If you have a minute, read ahead for all the specifics on this luxury mattress, or feel free to jump ahead to the recap and scoring sections. Click the button below and use our coupon code "sleepadvisor20" at checkout. Sleep hot – Brooklyn Bedding has gone to exceptional lengths to incorporate cooling features in multiple layers of the Aurora, and it is one of the coolest-sleeping mattresses we have reviewed. With its special cover technology, the gel and copper infused into its foams, and the temperature-regulating airflow of the coil layer, you are highly unlikely to overheat. Enjoy bounce – If you love the springy feel that only coils can give, you will like the Aurora. It helps with ease of repositioning and is great for bedroom activities. Need pressure relief – The hybrid’s combination of foams gently cradles the body, providing great pressure relief, especially in the hips and shoulders of side sleepers, who tend to experience the most stress in these areas. Want an all foam feel – The pressure-relieving foams of this mattress are supported by a base layer of pocketed coils, which give it a higher bounce that helps you change positions and an improved airflow that allows the bed to sleep cooler, compared to some all-foam brands. In that case you can check out our other bed reviews here, or our in-depth research with our top rated picks here. In total, the hybrid has a thickness of 13 inches. The first layer is a 1.5-inch layer of copper gel Energex™ foam with TitanCool™ technology. This quick-responding layer provides pressure relief that should never overheat because the highly conductive gel helps to transfer heat away from the body. The fourth layer is made from 8-inch Quantum edge pocketed coils that provide edge-to-edge support, durability, and stability. Coils along the sides of the mattress are reinforced for additional structural integrity in the edges. The fifth layer is a 1-inch base layer of foam that forms the bed’s foundation underneath the coils. We scored the Medium option of this mattress at a 5 out of 10 on our firmness scale, with 10 being the firmest. The company offers two other firmness levels, the Soft and the Firm, which they’ve scored at 3 and 7, respectively. Aurora’s materials do not allow you to sink too deep and most are quick responding, so you shouldn't feel stuck. The Quantum coil unit offers a good, deep bounce and support, and hyper-elastic TitanFlex™ adds some additional bounce in the comfort layers. Both the quick response of the materials and the bounce make for easier repositioning. Side sleepers, who tend to sleep with their weight concentrated onto a smaller surface area, are particularly prone to pressure in their hips and shoulders, the heaviest points of most bodies. This bed will cradle these points for excellent pressure relief, while the supportive coils will help keep the spine well-aligned. Side sleepers who need additional pressure relief may consider trying the Soft option of this bed. The Brooklyn Aurora is a “super-cool” new luxury hybrid. Brooklyn Bedding has entered the luxury hybrid space with a mattress so packed with high-end cooling and comfort technology you will hardly believe the Aurora came out of a box. The family behind Brooklyn Bedding has been in the mattress business for 25 years and has put that expertise into their mattresses. Because they do all of their design and manufacturing in-house, they are able to pass on savings to their customers. A luxury Queen-size bed that could cost thousands of dollars in the retail space is now available for $1,699. Overall, the Aurora is a worthwhile investment that delivers on comfort and is built to last. Brooklyn Bedding Review For 2019 – Is It Worth Your Money? Between this mattress, the Alexander Hybrid, Winkbed, and Aviya, all in their firmest options, what would work best for a couple who prefer a firm mattress without the sink in feeling? Tried the Kaya but felt inadequate support when stomach and back sleeping. It’s a great mattress, but be sure to have someone strong next to you when it arrives. It’s very heavy, I remember we had such a trouble getting it in the house. I’m a stomach sleeper and had so much trouble with finding a mattress that suits me. I almost gave up and then Aurora draw my attention. It’s firm just the way it should be, perfectly cooling and if you’re lazy like I am it’s great news that there’s no flipping or rotating necessary. Hi, excellent reviews guys, I learned a lot. I just wanted to ask do you think that Aurora will be suitable for a back sleeper, 154lbs, 6’21’’, with a pretty restless sleep. I would appreciate any advice. Hi jerry! thanks for reaching out. We think Aurora could be great for back sleepers. 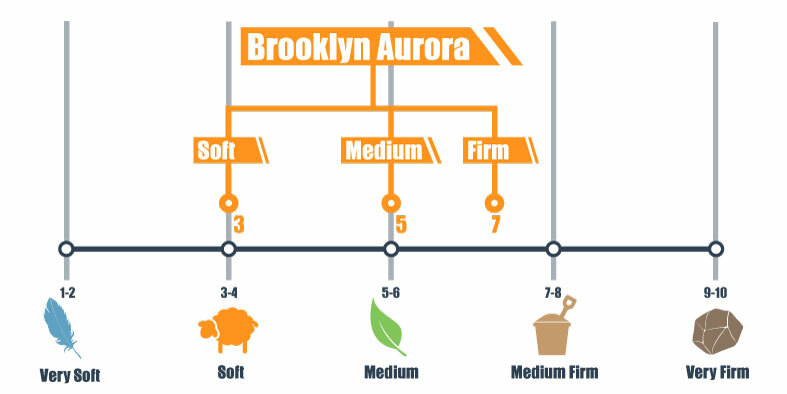 Brooklyn offers a range of firmness options, but Medium tends to be the most popular. As you are slimmer and taller, we might recommend that so that you’re sure to get the proper comfort and support that won’t make you feel stuck. Aurora meets my standards completely. It has all the features I need and seems like it’s gonna last forever. Very quality materials. That’s what I call well spent money. Great mattress overall. Loving it! I didn’t plan on buying a new mattress, but now I’m convinced I should give it a try. I can already imagine it in my bed, looking amazing. Thanks for review, it really opened my eyes. Hi! I’m an active person who works out every day and tends to wake up throughout the night. I also sleep hot sometimes. Right now I’m on the Nest Bedding Love and Sleep (medium) and it doesn’t provide me enough support. I’m looking at the Bear Hybrid and Brooklyn Aurora as replacements. Any thoughts as to which is better? I’ve read a lot of reviews and they both seem to be well regarded. Thanks for your help! Hi Sarah. Which one is better for you will largely depend on your own preferences and individual body type. It’s hard to say for sure without trying them, but luckily they both have generous sleep trials. We often do versus articles on beds like these so be sure to check back as we’re updating content daily. Thanks for reaching out! Broolyn Bedding now has many stores where you can try out theirl lines here inthe Phx, Az area. It was a deciding factor for me rahter than just ordering on line. But I will tell all of you big folk this..I am 6’2” 280 pds ex college football player with many..after effects of that career. I went in specifically to purchase just the signature mattress after reading about it. But the Aurora? Its the Sh..I mean stuff!!!!! Best bed I’ve ever owned. Its got lotsa thickness, edge support and comfortability. I brought the firm and its still like a medium compared to a lot of companies. Best purchase I’ve made to take care of me in the last 10 yrs! great mattress people.I know some say its expensive. But….Do you want a great nights sleep or the alternative?